The holiday home offers a large living room/lounge with dining and kitchen area and 1 seperate bedroom with king size bed, 1 bathroom with hot shower, a front balcony with views and an open air cooking balcony in the back . The cozy home is fully furnished in modern interiors and fully equipped with everything needed for up to 2 persons (extra bed is available) as well as 32″ flatscreen TV, DVD player, cable tv, air condition, fan, full size fridge, safe, toaster, coffee machine, water cooker, double stove, microwave, hot water, toiletries, cutlery and plates, pot and pan, free high speed wifi, bed linen, board games and baby cot (on request). Our guests have free access to the communal pool at our neighboring partner resort 100 meters away where there is also a restaurant/bar that serves breakfast and Thai/European cuisine. 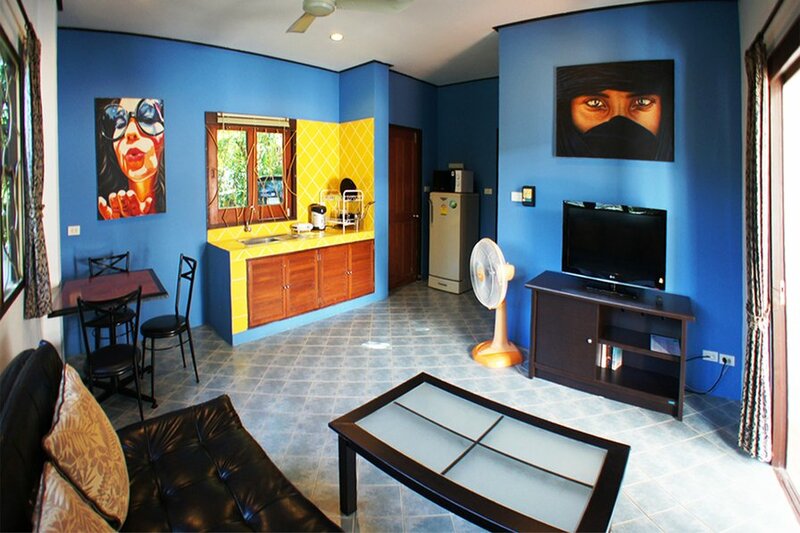 The house is located near the well known Q Bar in a secure complex of houses and apartments. We have private road access here in a dead end road so there isn't any traffic other than the residents. I live here myself as well with my wife and baby son in one of the apartrments and I look forward to taking care of all my future guests.